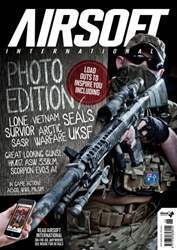 Airsoft is all about the image and the emotions that image stirs up. The sights and the sounds are part of what make the hobby so absorbing and so enthralling for all of us. “Less words, more pictures” is the over-riding theme and this special edition of Ai will serve purely to feed your eyes, fuel you imagination and ignite your passion for airsoft.